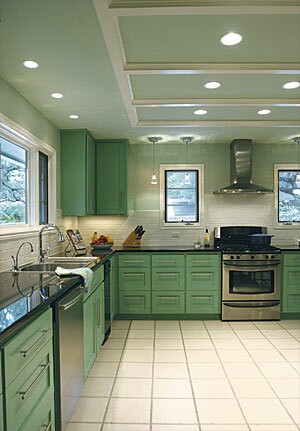 Most kitchen remodels that I design turn out to be major affairs. The homeowners have lived with cramped, outdated kitchens for so long that cosmetic updates just aren’t enough. 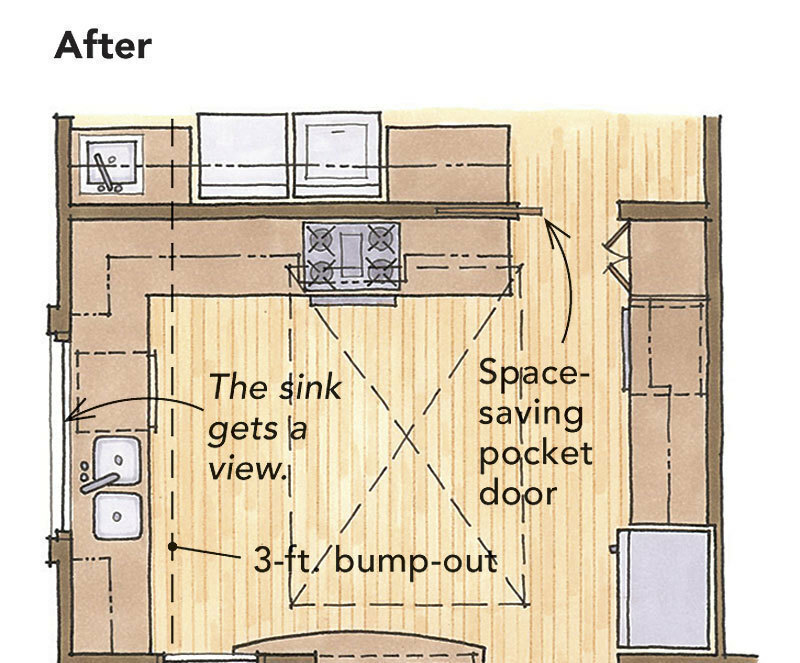 Your kitchen may be a better starting point. 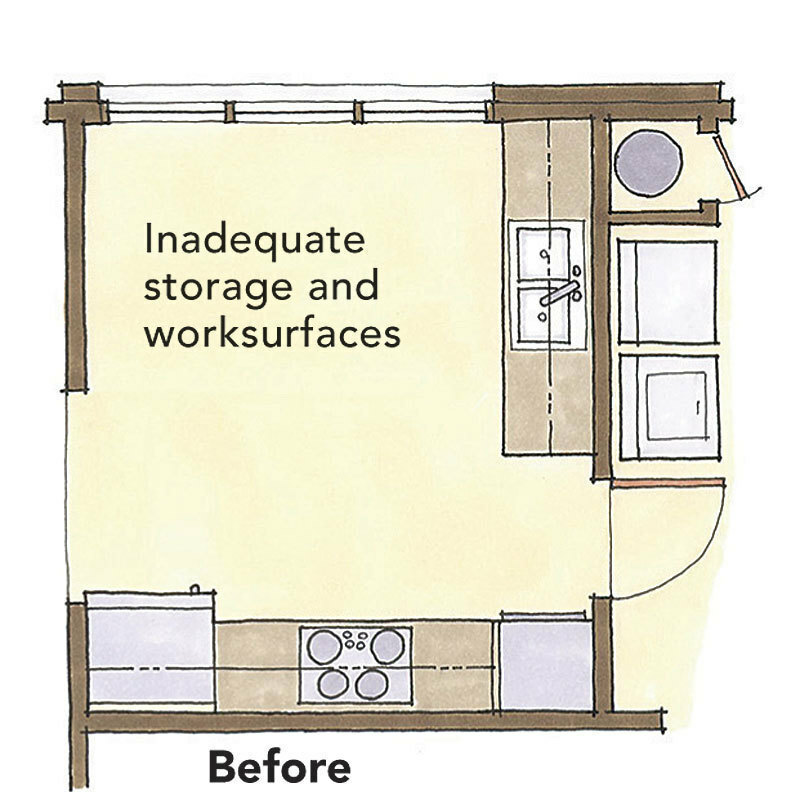 If you have enough storage and counter space, a functional cleanup area, and sensible traffic flow, gutting your kitchen may not be necessary. 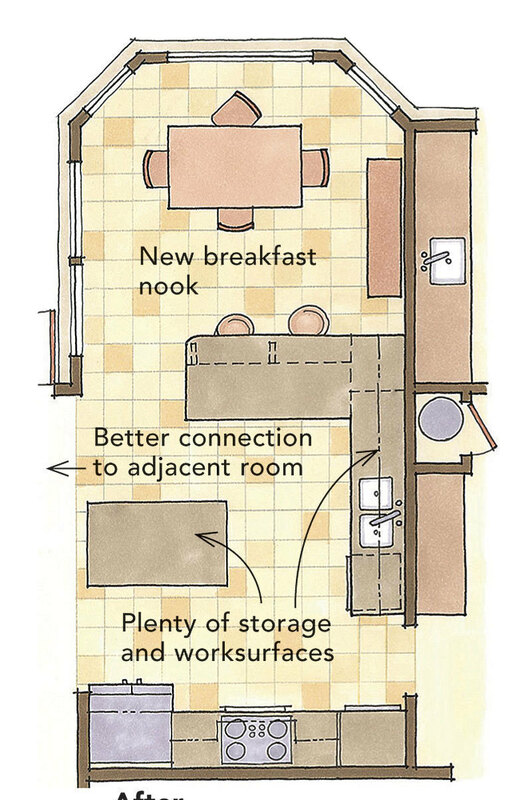 By focusing on key upgrades, an old kitchen can come to back life with a smaller investment. 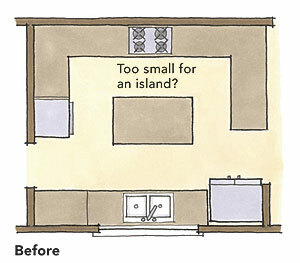 Either way, kitchens are the most expensive room to remodel, so it’s easy for even a modest wish list to outpace funds. Because it’s my job to help homeowners make remodeling decisions, I’ve put a lot of thought into when you should splurge, how you can save, and what you should never do. 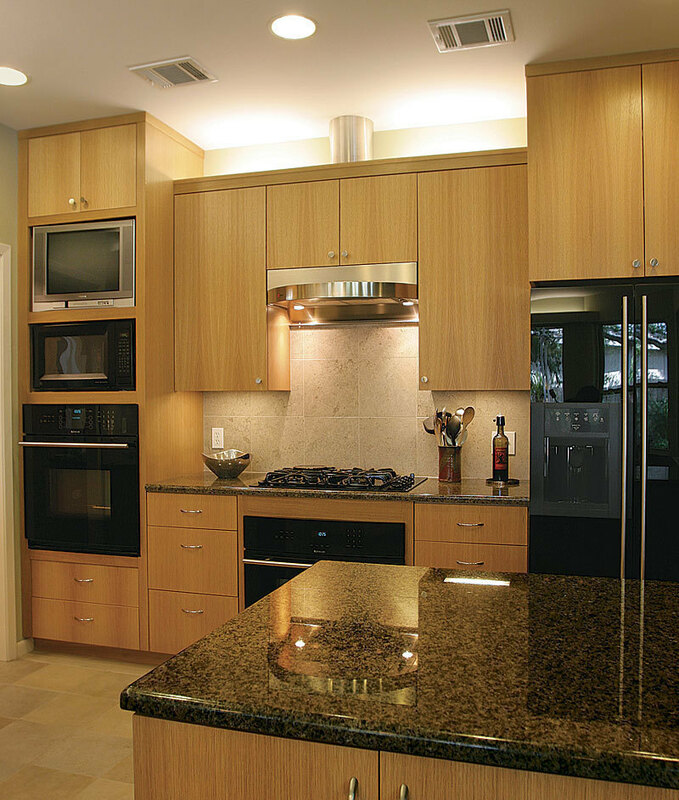 Unlike the standard dimensions of stock cabinets, custom cabinets make the most of every inch of a kitchen. Made of cherry, mahogany, oak, maple, or Douglas fir, custom cabinets are typically built with furniture-grade details by a local cabinetmaker. When splurging on stain-grade (clear-finished wood) cabinets, make sure the cabinetmaker uses clear lumber culled of knots, mineral streaks, and sapwood, and insist on color and grain direction that are consistent throughout. In this price range ($500+ per linear ft.), you should expect durable, solid-wood drawer boxes with dovetail joints, solid-wood door and drawer fronts, full-extension undermount slides, and top-quality hinges. You can save by ordering painted, semi-custom cabinets from a national manufacturer. These cabinets are more affordable ($300 to $400 per linear ft.) because the wood doesn’t have to meet the higher standards of appearance that stain-grade cabinets do. Drawers are more expensive than doors with shelves behind them, so ask for fewer drawers if your budget is tight. And skip the dovetail joints for drawer boxes. An interlocking pinned or dowelled joint can last for decades. If you can’t afford undermount drawer slides, choose side-mounted ballbearing drawer slides. You’ll appreciate their fair cost and smooth operation. Don’t buy the cheapest cabinets you can find ($150 to $200 per linear ft.) to save money. Cabinets are the heart of a kitchen, and entry-level cabinets are likely to have components made from particleboard, which can lead to sagging shelves and hinge screws that pull out. They’re also apt to have poorly made door hinges, drawer boxes, and drawer slides that cannot be expected to hold up to years of use. If your budget’s tight, you will be better off saving in other areas. 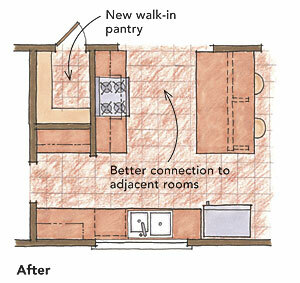 The homeowners splurged to create a better floor plan with a walk-in pantry. Part of a bigger remodel, the kitchen budget was limited, so the homeowners chose to save money on finishes and countertops, knowing these items can be upgraded easily later. 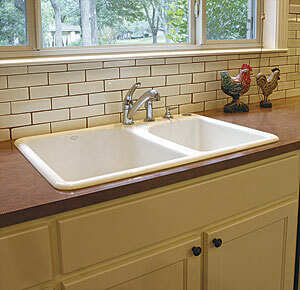 They also saved on fixtures and plumbing with an inexpensive drop-in sink in the same location as the old sink. 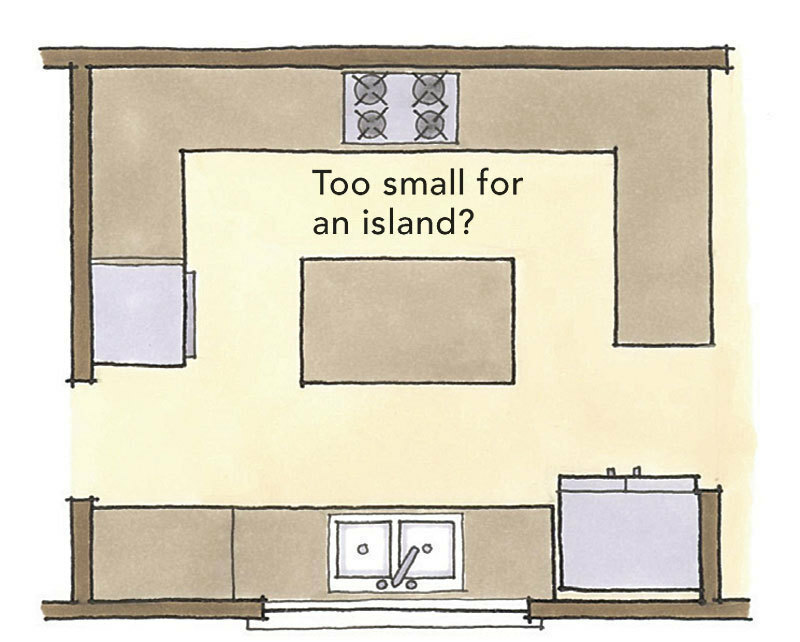 Splurges beyond construction were mostly for professional-style appliances. Painted cabinets: $300 per linear ft.
Plastic-laminate countertops: $10 per sq. ft. 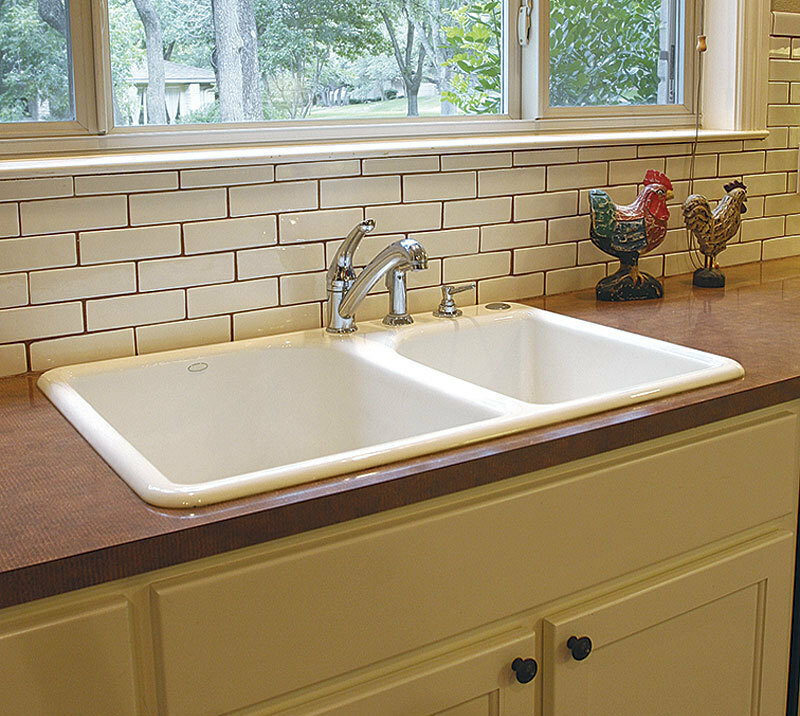 Ceramic subway-tile backsplash: $10 per sq. ft.
Mexican Saltillo floor tile: $5 per sq. ft. Although they can cost well over $65 per If you have to have stone counters but don’t have thousands to spend, look for slabs used by high-volume builders in your area. These slabs are less expensive due to limited color choices, but they are widely available. Choosing simple edge profiles can save money, too. If you’re looking to upgrade your counters, contact a company that resurfaces existing counters, such as Granite Transformations (www.granitetransformations.com). For an artistic effect, you can splurge on concrete countertops. Their shape, color, and finish are limited only by your imagination. Stainless-steel tops can add a modern look to your kitchen, and maple butcher block is a beautiful way to contrast painted cabinetry. Available for under $60 per sq. 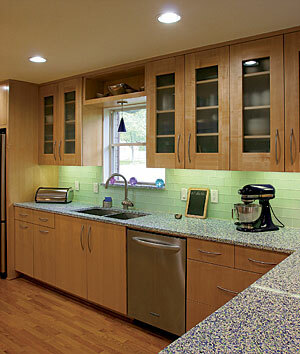 ft., solid-surface countertops from manufacturers like Corian and Avonite are a more affordable option. These counters are nonporous, heat tolerant, and scratch resistant, with consistent color all the way through. Even more reasonably priced are tile and plastic laminate ($7 to $20 per sq. ft.). Tile is available in a range of sizes, colors, patterns, and finishes, but my recommendation is to stick with dense ceramic or porcelain, which are impervious to moisture. Plastic laminate is nonabsorptive and heat and stain resistant, but can be scratched. Because countertops are an easy upgrade and because plastic laminate is so inexpensive, it is a great entry point if you need to save now but will have more to spend later. In general, you should avoid wood countertops around sinks unless you’re meticulous about wiping up splashes. Messy folks should shy away from marble, travertine, and limestone slabs. They can be stained easily by wine, lemon juice, and the like. Think twice about tiles with tumbled or otherwise uneven edges that require wide grout joints. And don’t use cheap glazed wall tile on a countertop. Heavy metal pots and pans can scratch it. 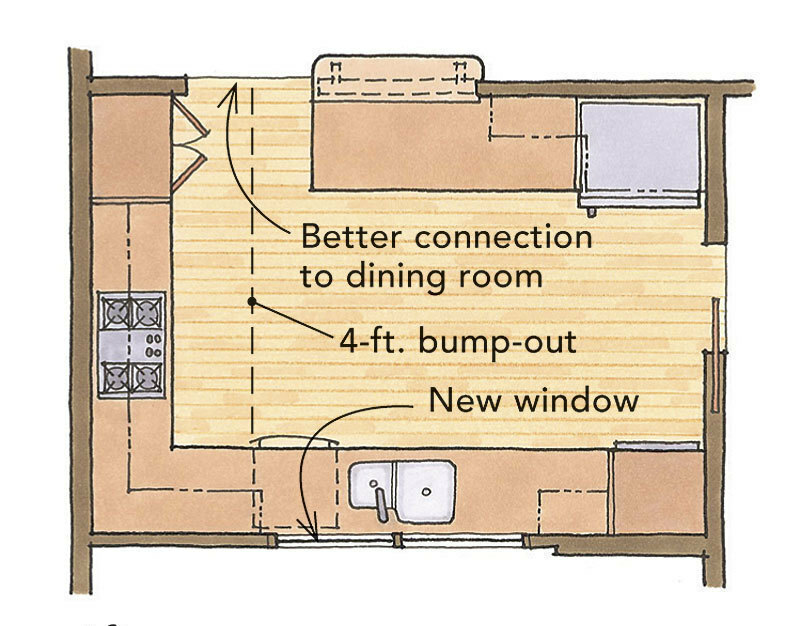 These homeowners earned a tax deduction by donating their old kitchen to Habitat for Humanity. 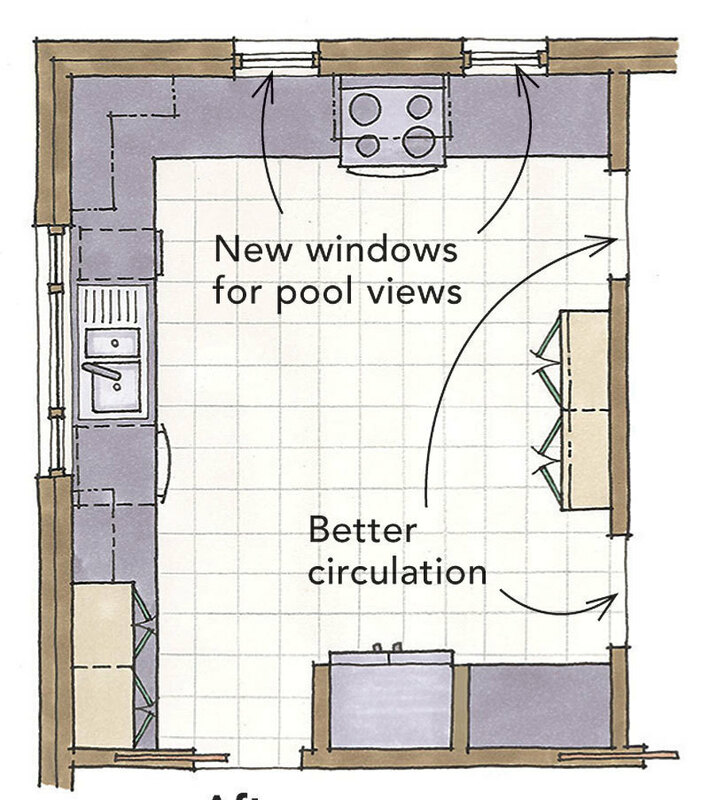 Since they wanted to add on to the house anyway, they decided to splurge on stretching the kitchen 4 ft. Stainless-steel appliances were another splurge, but a combination microwave/convection oven speed cooker served up some savings. Keeping the sink location and matching (instead of replacing) the existing sink window also saved the budget. 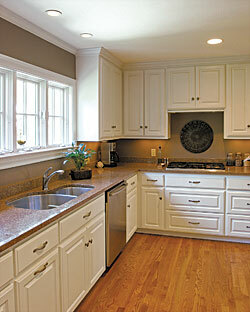 Granite countertops: $65 per sq. ft.
Oak flooring to match original floors in house: $12 per sq. ft. 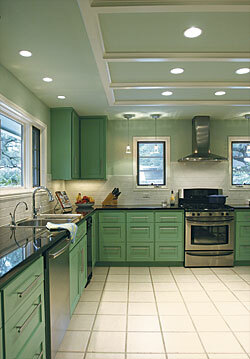 Painted drywall above 4-in.-high granite backsplashes: $20 per linear ft.
Backsplashes can cost a lot (up to $50+ per sq. ft. for slab materials) or next to nothing (the price of a quart of paint). Splurge on durable, easy-to-clean, and decorative materials, including stainless steel, stone, tile, and glass mosaics. Remember, grout should be kept to a minimum and must be well sealed. You can avoid grout joints altogether by choosing the same stone slab used for the counters. 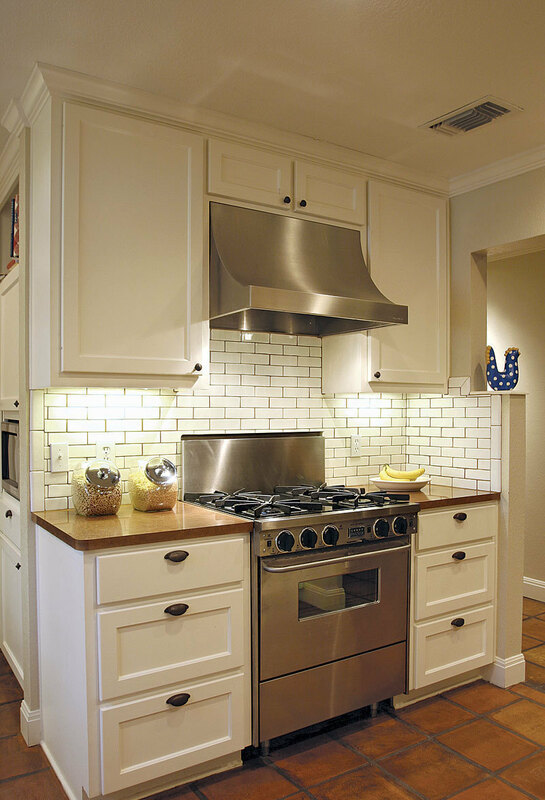 Save backsplash bucks by choosing larger mass-produced tiles. If tile is not the look you’re after, a simple 4-in.- or 6-in.-high backsplash made from the countertop material is cost effective and practical, especially if it’s laminate. Or simply paint the wall with a durable finish. Avoid rough or porous backsplashes that will be difficult to clean where you most anticipate splatters. 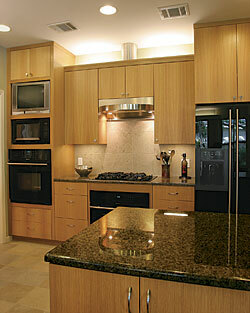 Wood backsplashes eventually show moisture damage. Keep in mind that shiny materials below upper cabinets show reflections of undercabinetinet lights. I prefer honed, matte, or satin finishes. For my own kitchen remodel, I saved considerably by doing a good bit of the work myself, starting with the demolition. But even this thrifty weekend warrior was wise enough to realize that he couldn’t do it all alone. With a contractor’s help (and a bit of splurging), I bumped out the space 3 ft. into the backyard and raised the ceiling height in a dramatic way. Custom quartersawn-maple veneered cabinets: $400 per linear ft.
Prefinished, engineered pecan flooring: $15 per sq. ft. When it comes to flooring, you can spend a lot of your budget on a kitchen floor by laying down oak, maple, cherry, pecan, Douglas fir, or reclaimed longleaf pine. Traditional wood flooring is 3⁄4 in. thick and is sanded, stained, and finished after installation ($10+ per sq. ft.). Durability varies among species, but a professional floor finisher should be able to make even the softest wood species look good for a long time. Premium-grade engineered wood is a more immediate alternative; you can walk on it as soon as it is installed ($8 to $20 per sq. ft.). And forget the rumors that you can’t sand and refinish these floors. They can be lightly sanded (called screening) and refinished when they begin to show wear. For flooring without water worries, consider porcelain tile. If porcelain is too austere, try tiles cut from slate, limestone, granite, or marble. Save without sacrificing character or durability by using stained and sealed concrete ($8 to $15 per sq. ft.). Where concrete slabs are common, this can be an economical route because the slab is simply given an attractive finish. A multitude of affordable ceramic floor tiles ($3 to $7 per sq. ft.) are available as well. If you want to save on flooring but prefer a softer surface, consider cork, linoleum, or vinyl. An added benefit is that not everything you drop will break. 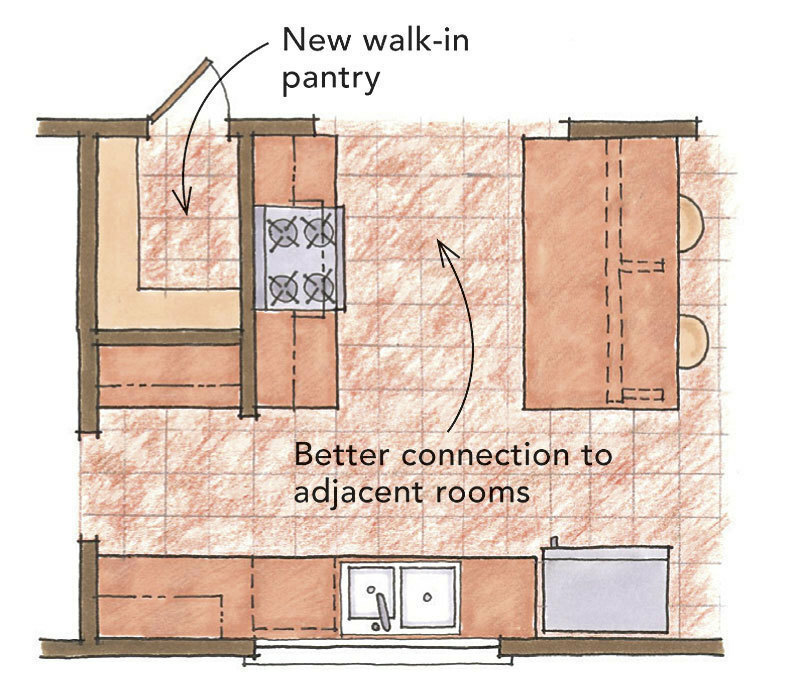 Floating laminate and inexpensive engineered floors such as bamboo rest on a thin foam underlayment, so you can keep standing in the kitchen longer. 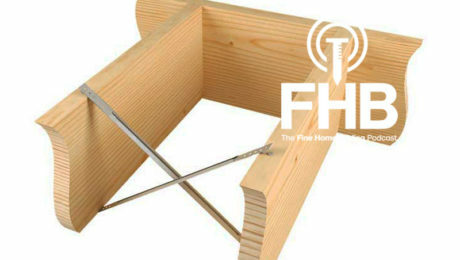 Before buying a wood floor, know that a water leak in the kitchen can cause the boards to swell and buckle. If you are prone to dropping things, check to see how easily the wood dents. (Try this test with a sample board: Drop a can of tuna or tomato paste from 3 ft. up, and see what happens.) If you have dogs, their nails can scratch the finish. (Try scratching the sample with the tip of a ballpoint pen.) In high-traffic kitchens, avoid using light grout colors on a tile floor, and avoid highly polished floors that are slippery when wet. 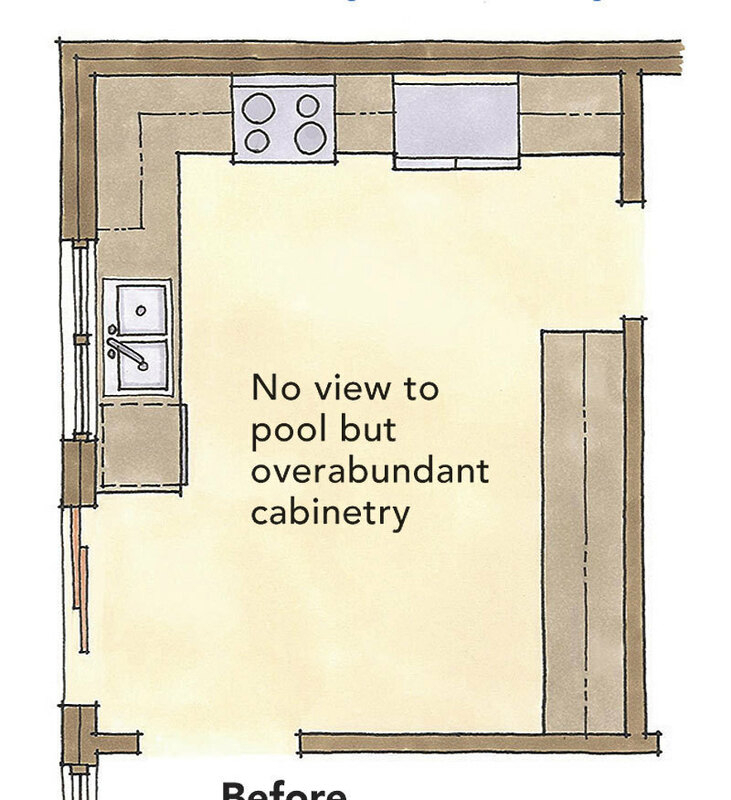 This family had too many cabinets in their kitchen and no views of the backyard pool. The remedy? 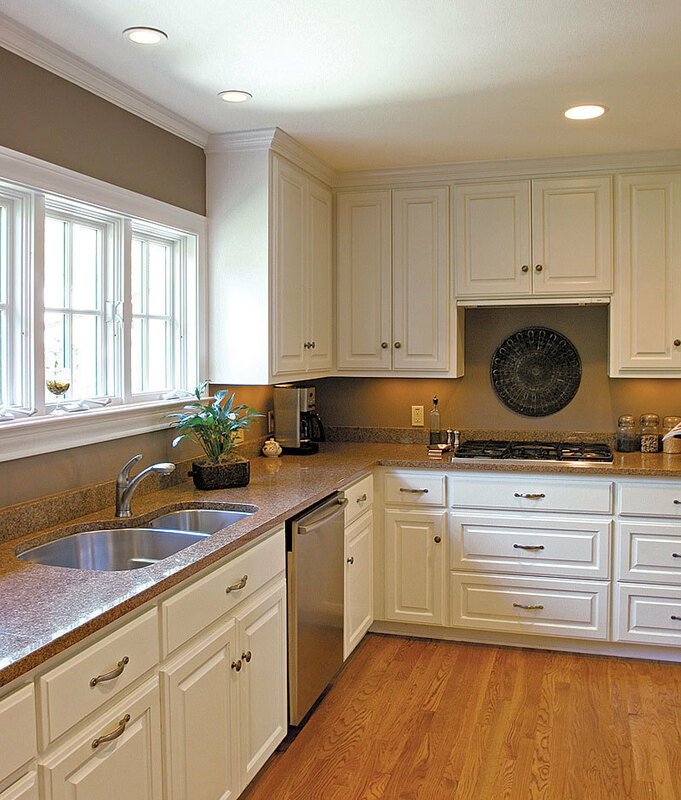 Swap out wall cabinets for windows. 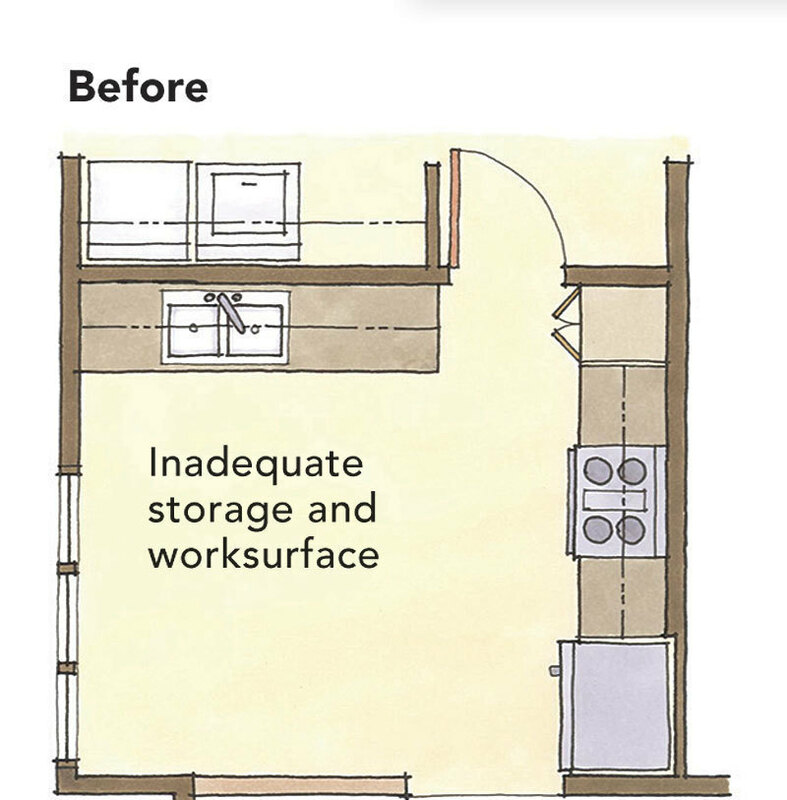 With plenty of space on the interior walls for cabinets, the loss of upper cabinets on the exterior walls was not a deal-breaker. Along with reusing their existing appliances, it was one of the ways this family saved. Quartz-composite engineered slab countertops: $60 per sq. ft.
Porcelain floor tile in a simple pattern, without borders: $7 per sq. ft.
Well-designed fixtures can make cleanup less of a chore, they can add style to a kitchen, and they should last as long as any other material. I don’t advise buying the least expensive faucets and sinks you can find, but you won’t have to spend a lot to get a lot, either. Splurging on a faucet means paying for improved functionality, stylish design, and top-quality materials and finishes ($400+). Acknowledging the trend for pro-style fixtures, manufacturers offer tall faucets with pull-down sprayers that share the solid brass or stainless-steel body materials that make up the core of all premium faucets. You can save money by opting for a faucet with tubular-brass construction (starting around $150). Basic finishes and standard designs cost less, too, as do fixtures bought online (kitchensource.com, sinksgallery.com, faucet.com, faucetdirect.com) or at a home center. Don’t buy a faucet online without seeing it in person first, though. Visit showrooms and home centers to do your homework. High-end sinks are made from several sturdy materials and come in many sizes and configurations other than the common one-and two-basin models ($250+). Add convenience to cleanup with an oversize singlebasin sink, or a three-bowl model with different basin depths for different functions. An integral drain board keeps counters drier. If you want to make a statement with your sink, order one carved from granite or soapstone ($1000+), or integrate a custom-designed concrete sink into the countertop. If you’re sticking with stainless steel, you’ll appreciate the stiff, quiet feel of 16-ga. metal. 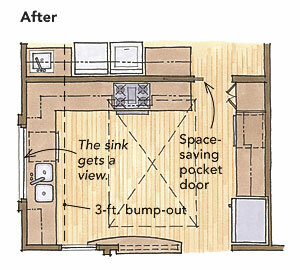 Save on sink installation by choosing a drop-in sink. You can find plenty of attractive, durable drop-in sinks that don’t cost a bundle (under $250), from 18-ga. stainless steel to solid surface. And don’t overlook the venerable workhorses made from vitreous china (aka fireclay) and enameled cast iron. 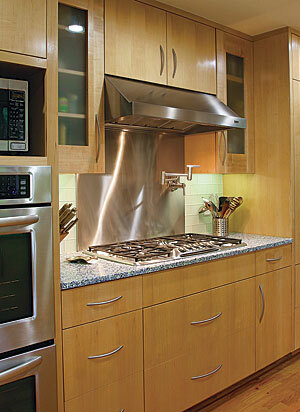 Avoid thin stainless-steel sinks (22 ga. is very thin) because they are noisy and dent easily. Be aware that a heavy pot can chip enameled and vitreous-china sinks. If your back is sensitive, make sure you’re comfortable washing dishes in a deep sink before purchasing one. Finally, make sure the size, shape, and configuration of an undermount sink are completely to your liking before the installers cut a big hole in your countertop. 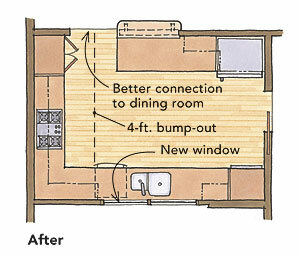 Splurging on a breakfast-nook bump-out and raising the ceiling by 1 ft. added much-needed space to this remodel, which required stripping the kitchen down to the studs and starting over. 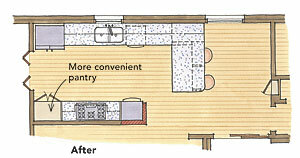 With more floor space, the remodeled kitchen has room for a center island that doubles as a prep and serving station. 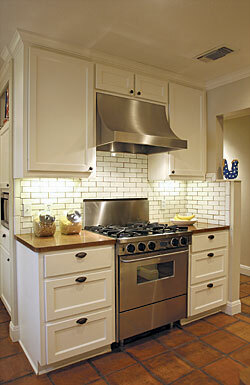 Custom whiteoak cabinets: $400 per linear ft.
French-limestone backsplash tile with matte finish: $15 per sq. ft.
Polished-granite countertops: $70 per sq. ft.
Porcelain floor tile that looks like stone: $8 per sq. ft. If you have a big kitchen and you cook a lot, it might make sense to splurge on appliances. 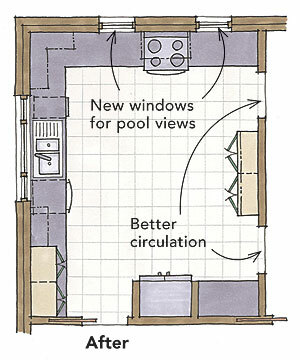 But when you choose new appliances, keep in mind that this is a good place to save both money and space. In fact, many of my clients save by sticking with their existing kitchen appliances. If you decide to splurge, consider restaurant-style models that boast high-Btu cooking power, extra burners, and extra oven capacity ($2000+ per appliance). 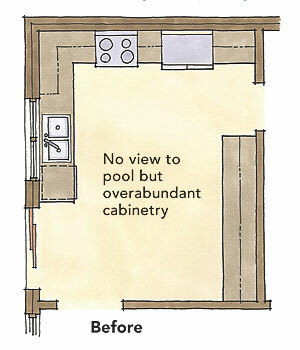 Keep in mind that these models consume a lot of space with gas cooktops and convection ovens as wide as 48 in. and 30 in., respectively. 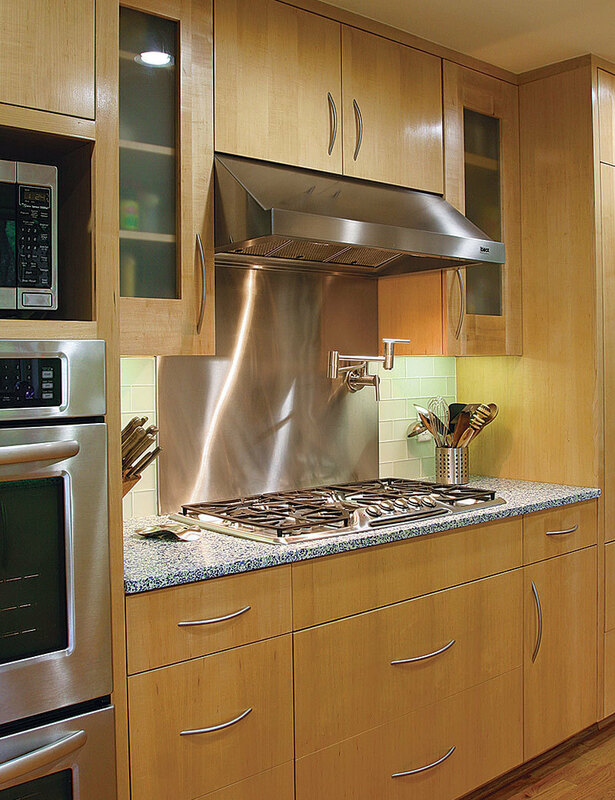 High-Btu cooking also requires the installation of a powerful hood fan ($1800+). Save space and money with a slide-in range ($250+). 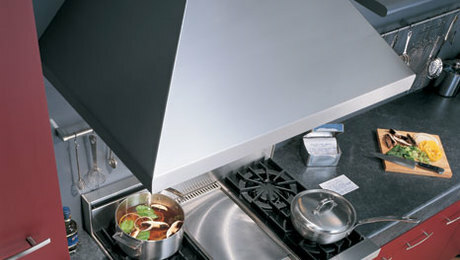 Use a “microhood” ($150+), which is a vent hood and microwave oven in one (make sure it vents outside the house). 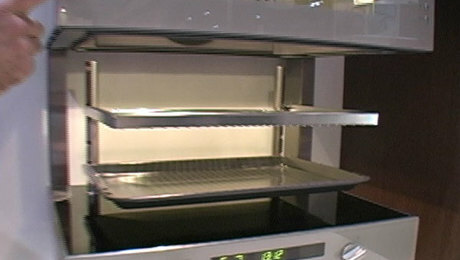 Another combo is a speed cooker that can function as a baking oven and a microwave ($1500+). Appliances with white or black enamel finishes cost considerably less than stainless steel. You can save over time by choosing energy-efficient dishwashers, refrigerators, and freezers certified by Energy Star. And remember, smaller ovens heat up faster, which also saves energy. Avoid bargain-priced dishwashers. They are likely to be noisy and probably won’t clean well. Also be aware that most counter-depth refrigerators cost more but have less storage volume than full-depth models. Resist the temptation of hip stainless-steel finishes if there are little sticky fingers about. Only the window above the sink is original to this kitchen. 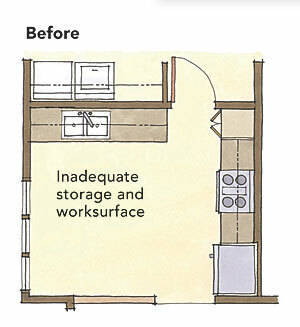 Even the pantry closet, with its 2×4 walls, was removed and rebuilt as a pantry cabinet, gaining a few inches of precious storage space. 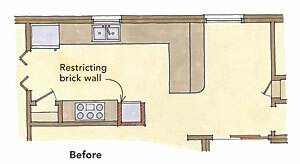 Likewise, a brick wall next to the old 24-in.-wide wall ovens was removed to allow room for 27-in.-wide ovens. 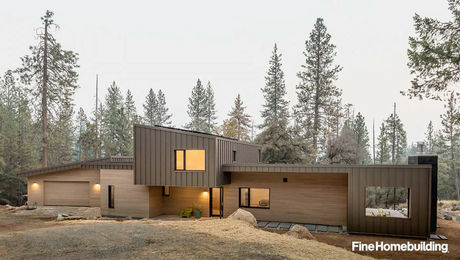 These homeowners splurged considerably, but made sure to stay within the existing footprint to tame already-high construction costs. Terrazzo countertops with recycled-glass chips: $100 per sq. ft. 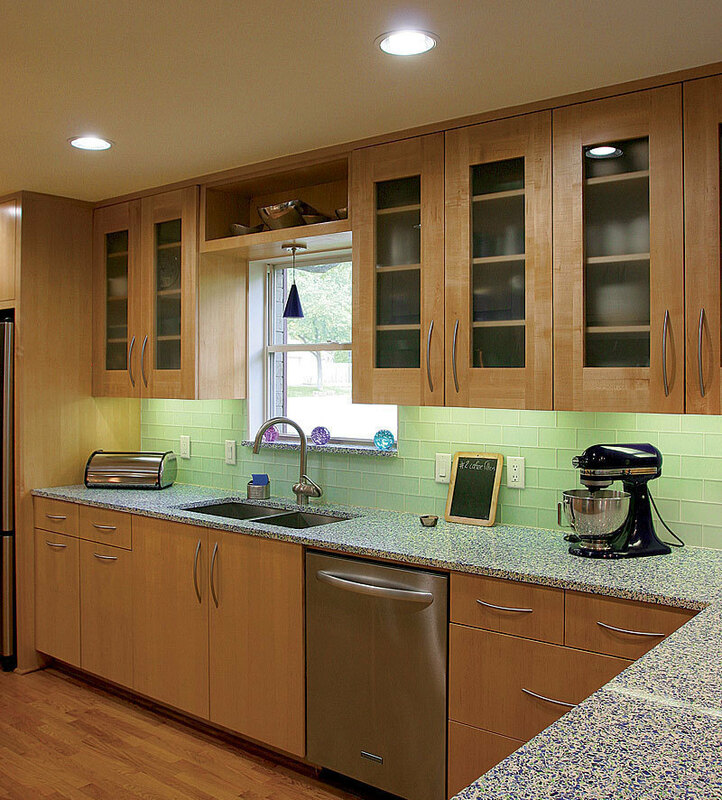 Custom, quartersawn-maple cabinets: $425 per linear ft.
Glass-tile backsplash: $25 per sq. ft. 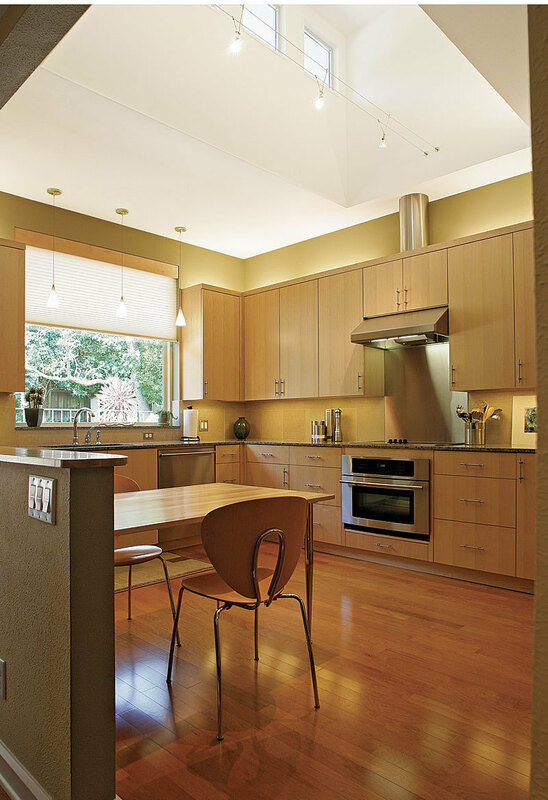 The goal of lighting a kitchen is to integrate layers of adjustable light so that you can see well enough to dice an onion or dial in the right mood for a party (see “Kitchen Lighting Design”). 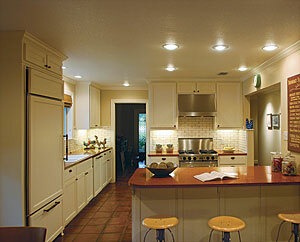 Decent kitchen lighting can be achieved with nothing more than well-placed recessed lights and dimmers. Including trim and baffle, these lights range from $25 to $125 per fixture. 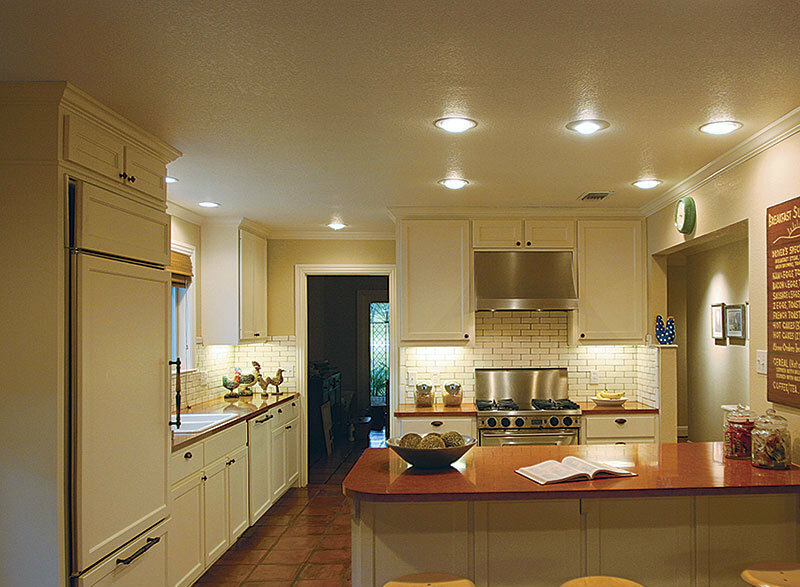 Two areas where can lights fall short, however, are countertop illumination and style. So consider splurging on undercabinet lighting ($45+ for 24-in. fixtures), and choose at least one decorative fixture to add style. You can also save by choosing energy-efficient fixtures and bulbs. 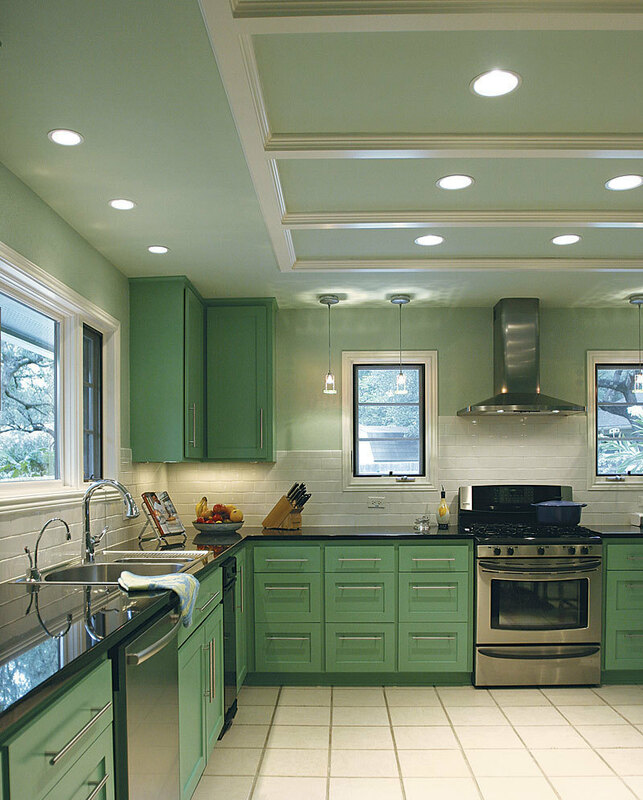 The most important mistake to avoid is underlighting the kitchen. A poorly lit kitchen is impractical and potentially dangerous. If you use recessed cans, skip the budget-grade white plastic trim and baffles; they will yellow over time. 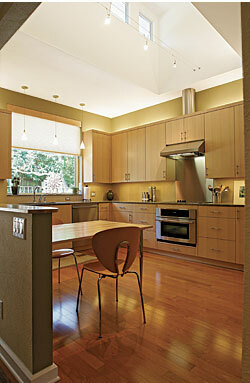 Know that halogen undercabinet lights can heat up the cabinet above. Opt for cooler LED, fluorescent, or xenon instead. Don’t choose tile for countertops unless you are willing to scrub grout joints often. Don’t settle for cheap drawer slides. They’re noisy and flimsy. Don’t install a light-gauge stainless-steel sink. It will flex, dent, and scratch easily. Don’t buy cheap cabinets to save a penny. They won’t last. Don’t skimp on lighting. A dim kitchen is dreary and can be unsafe. Don’t install wood floors in an active family kitchen unless you won’t mind refinishing them occasionally. 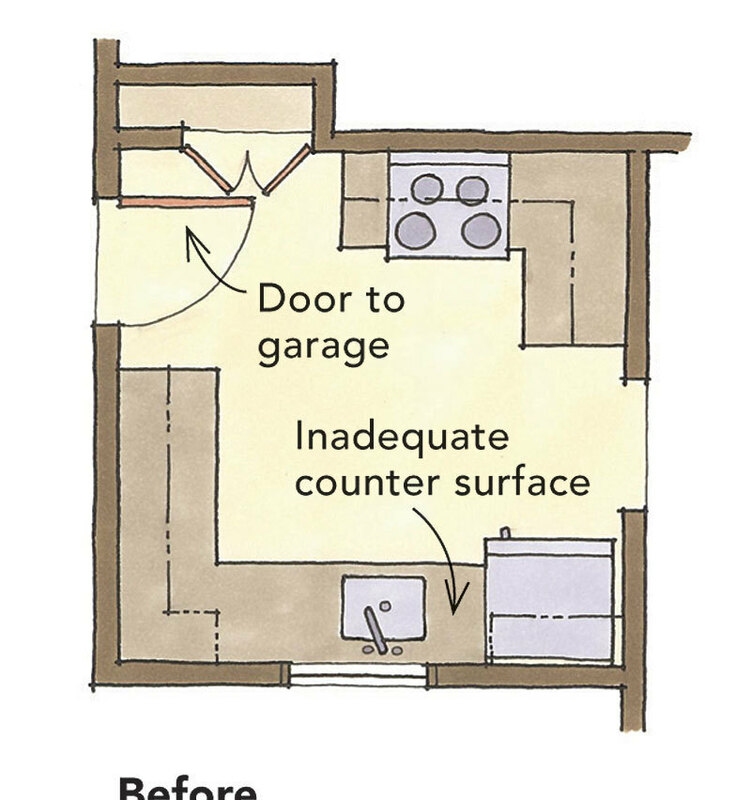 Don‘t be stingy with counter space next to the sink, cooktop, or refrigerator. Don’t use halogen undercabinet lights. They’re too hot. Don’t install hard-to-clean backsplash materials such as porous stone, brick, or stucco. 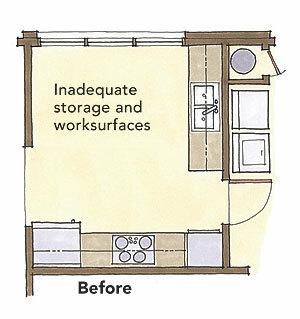 Before you tear out those old cabinets, start with a design prepared by a professional specializing in kitchen remodels. A good designer can help you arrange space, organize functions, and make good choices according to your unique needs, wants, and budget. He or she will document the multitude of decisions that you make together during the design process, culminating in drawings, written specifications, and material lists used by contractors to prepare bids, obtain permits, and execute construction. 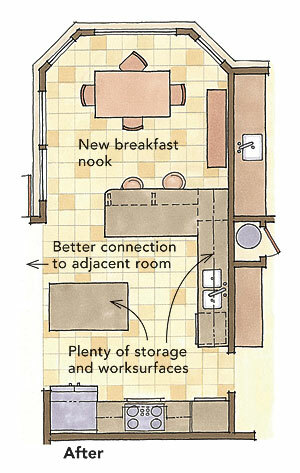 Finding the right kitchen designer is important. Look for a certified NKBA designer, architect, or interior designer with a portfolio that you like. 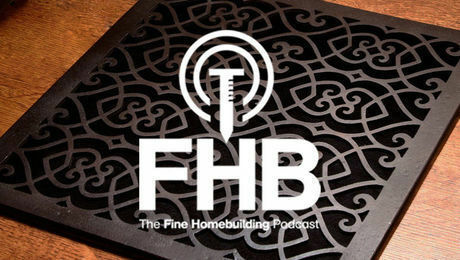 Talk to design-build companies that have a designer in-house. 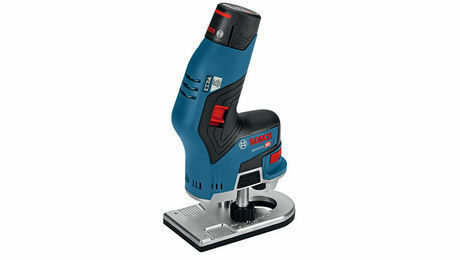 You might even be able to find qualified design help on the staff of a large cabinet shop or home center. Set up interviews with prospective designers, check their references, and visit projects to see examples of their work. Fees for design services vary widely depending on experience, services offered, design complexity, and regional markets. Some designers charge an hourly rate, while others charge a percentage of the construction cost or a lump-sum amount. Hourly rates can range from $40 to $150. For a percentage of the construction cost, the range can be 5% to 15% or higher. 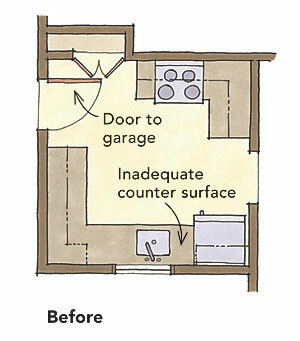 Magazine extra:Listen to a slideshow where DeGroot explains where he recommends savings and splurges in several kitchen remodels, including his own. Architect Paul DeGroot ([email protected]) designs custom homes and additions in Austin, Texas. Photos by Brian Pontolilo. Drawings: Martha Garstang Hill.